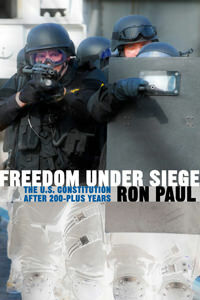 Here is Ron Paul's political manifesto, a courageous book on civil liberties and the rights of Americans that are relentlessly under assault from government. It was written in 1987, on the 200th anniversary of the Constitution, and is back in print for the first time. It is here that Dr. Paul provides his most extended thoughts on what it means to be a constitutionalist in the tradition of Thomas Jefferson. He connects violations of individual rights to an interventionist foreign policy and the supposed needs of national security. Here he blasts the draft and draft registration, impositions on the right of individuals to own guns, restrictions on the freedom to speak and write, and draws out the links between all these policies. Paul further discusses the tie between individual liberties and sound money. When a nation's money is controlled by the people instead of the state, they retain their essential freedoms. But when money is monopolized by government with no tie to a commodity, the state is in a position to ride roughshod over our liberties. Other issues discussed include the true meaning of patriotism, the moral law as it applies to politics, the meaning of leadership in a free society, the nature of the state in light of his experiences in Washington, and the historic and ever-lasting conflict between the individual and the state.